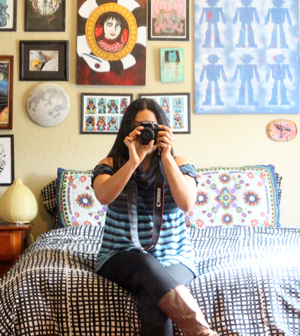 'Twas the weekend of Black Friday thrift store sales, what deals did you score? I took it easy and leisurely hunted for essential bits, ignoring the sales and even putting back some pretty vintage bits I could live without. They raised the price on DVDs at our local Goodwills, heartbreaking! But even with the elevated price, Mario 3 is my favorite in the series so I broke down and bought this set. I finally relented and bought some new work shoes, my old ones were falling apart at the seams; threatening to rupture and bring me down with them. I painted the frame blue and I use it as a coaster. I was going to make my nephew a dinosaur learning kit for Christmas, so I was happy to stumble upon this still-sealed Dinosaur Excavation kit. You chip the dinosaur bones out of "stone" with a real chisel and hammer. I love kid's science kits! My favorite find of the weekend is the retro "bean table" above (Any official name for this style? Help me out!) I donated a few things (ur, two boxes worth) to ease my conscience and squeezed him into the living room. It was a guilty and unnecessary purchase, but it fits in nicely. More to Come: I found an essential or two from my thrift list. They're receiving some DIY care right now, I'll follow up with the Before/Afters soon! Thank you for linking up to the first ever "Amaze Me Monday" blog party! The tiny mushroom on the far left is especially guilty. That table falls into the "Kidney" or "Amoeba" category. that table is ridiculous, and unfair! love it! and yes about the mushrooms, lol! 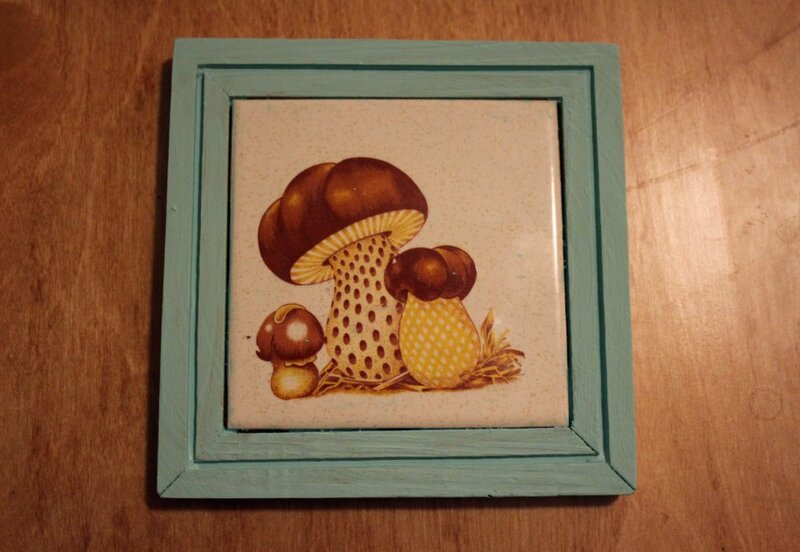 Ah, the good ole phallic mushroom art. Can't pass those up! Barbara: Thanks for the tips on the table title. Laura: 69 cents is an excellent price for phallic mushrooms! Really like that bean table too! Great finds! 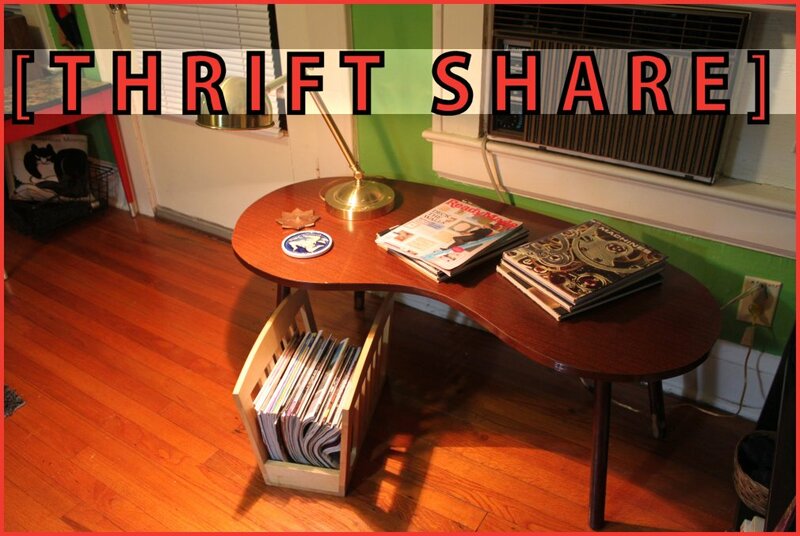 Love the table- was that a thrifty find too? Love that bean table. It's very cool. I have to admit there are things we've broken down and bought too, when they were something we really wanted. 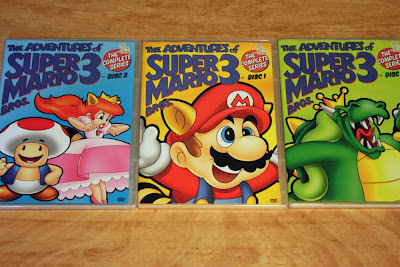 So yay for the Mario games! Oh that's a great price for your vintage looking bean table! And those phallic mushrooms conveniently priced at .69 cents are hilarious! This weekend, I found some older novelty toys that will be thrifted gifts to my sister. I can't say specifically on here, at risk she might read it and ruin the surprise! And I also found a nice hat that, oddly enough, fits my gigantic melon head. Only five bucks! I plan to include that in my thrifted fashion special in the near future. I've had some considerable luck in this area for a the last few months. And being a plus-sized girl, stumbling upon cute fashion finds that fit...is...forgive the pun: A Big Deal! 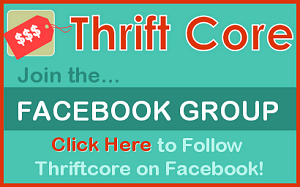 I hope to pay a visit to my favorite thrifts in a few days for some more craft supplies. Enjoyed the post! Love the kidney table! Came by way of Thrift Share Monday ... thanks for sharing. A kidney table! I love it. Great table at a great price! Unfortunately I had to work Black Friday, boo. 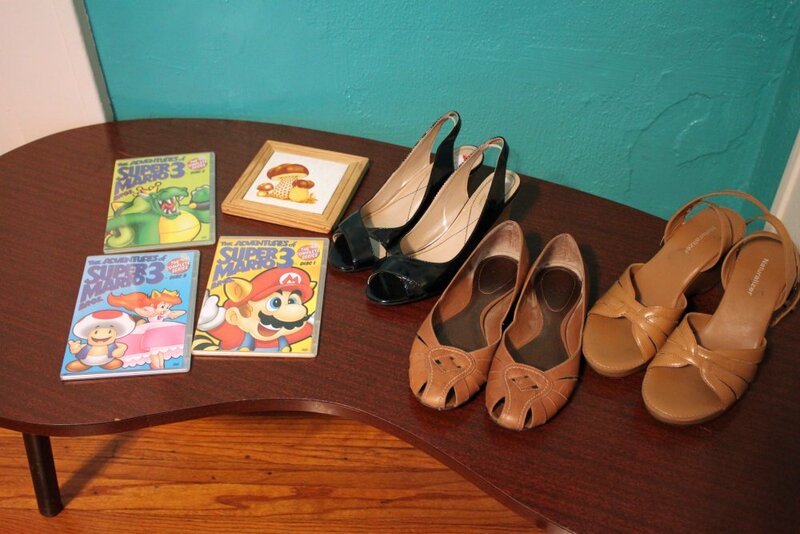 Fab finds, LOVE the table, dinosaur stuff and now I have the Super Mario theme bopping in my head, thanks! I love that table & the mushroom "art"! Super Mario always brings me back--great finds for sure. The table is ammmazzzzing! Beautiful piece, looks like its in fantastic shape too. I'm off to check all the web sites you put down below! Damn it I'm not going to bed anytime soon. Nice to meet ya btw! 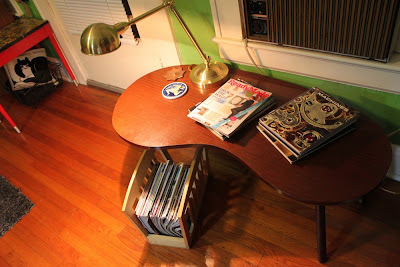 I posted some finds today -- only know the table as kidney bean. 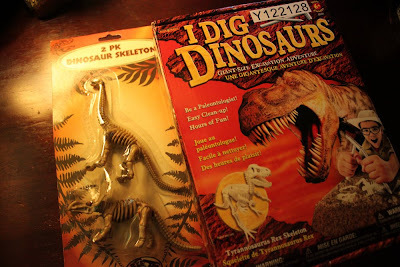 One year for my son's birthday party we bought a kit of dinosaur bones and dug a hole in the backyard, put the bones in the hole held together by plaster of paris, and filled it over with dirt and sand. The kids dug for it over and over to "discover" the bones! It was a huge hit. Have to agree with the others- that is a kidney table, the same shape used for swimming pools in old glamour Hollywood. I love it when I am watching "my shows" and DH sees an "expert" value old Ataris at $250 and Commodore 64s even higher. Great finds and thanks for all the pictures to go with it.